If looks can kill, a crustacean will. Have you notice how prawn or lobster-like the aliens in films look? From Alien 1 to 3 ( or is it 4) and down to the latest unforgettable but revolting film, Peter Jackson's other and lesser known District 9, prawns are almost always given an extra terrestrial role. And when they are laser blasted, their roe will splatter the screens. Whether your reaction is yucky or yummy depends on your preference for your regular prawn meal. If you are like my wife, the heads are the first to yuckily go off her plate with a Marian yell, "Off with their heads!" On mine, they yummily stay. 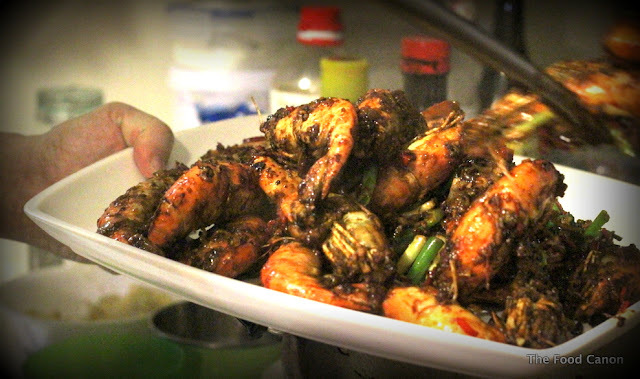 Let me introduce a crustacean species which is alien to most Singaporeans - the Freshwater aka River Prawns. While it certainly looks like some creature from Mars (has the Rover found any yet? ), some will claim that it's taste, like lobster, is also out of this world. And in some ways, matches up to it's far more famous cousin as an eating experience. Have you tried licking of the creamy roe off a lobster's head? If you did, it is not roe but more likely the creamy thermidor sauce. For when it comes to lobster, there is really nothing up there. But with freshwater prawns, especially the large ones, there are creamy treasures to be found. The experience is akin to the roe experience of hairy crabs (ok, maybe exaggerated). Sliced along the length of the large cooked prawn into two symmetrical halves. With a small spoon in hand, you will have a complete head to tail meal experience. Especially if they are in the hands of Auntie Ruby (there I go again). These prawns are best eaten "live", as in they are taken straight from the tank to be prepared for the table. If not, they need to be kept frozen as they deteriorate quickly in room temperature. As those caught in the wild are in demand in Malaysian restaurants, one does not find them easily available at the wet markets here.You can occasionally find them being sold and frozen ones are available at Sheng Shiong. They, as with seafood in general, freeze well. You can keep it frozen till about half an hour before cooking time. Take it from the freezer and thaw it in water. At the same time, start cleaning them. The good thing about Har Lok is that it is fairly easy to cook. Deep fry first then, stir fry. Cooking time is quick at about 15 minutes wok-time in total. Whether large or small ones, the recipe and cooking method is the same. If you can't get them, you can substitute with other types of large sea prawns. Dipping into corn flour and deep frying. Clean up the prawns by first giving it a hair cut. Use scissors to snip of the all the hairy stuff that is sticking out, the pointy horn at the head and pedicure the frilly legs. You may have to dig out the lump of sand or debris in the head with a pick at the spot where you have snipped of the 'horn.' Drain the prepared ones in a colander. Coat prawns lightly with corn flour. Leave about 5 tsp of oil in the wok. Put in the chopped ginger first and after a minute, add garlic, the dark and light soy bean sauces and chilis in. Stir fry briefly until fragrant but do not burn the sauces. Add the prawns and stir fry for about another 3 minutes or so. Add sugar and stock along the way. Taste and adjust sugar or for the saltiness, with light soy sauce. Towards the end, add dashes of Chinese wine. Dish and serve hot with garnishes. Perhaps it is time we petition for aliens in movies to look less crustacean-like. And as all cockroaches know, they are more deserving of that role. * Disclaimer: This recipe is not cholesterol-certified. "Perhaps it is time we petition for aliens in movies to look less crustacean-like.....cockroaches know, they are more deserving of that role". Cockroaches are not under the crustaceans. Hi Anon - it is interesting that you picked up the phrase.